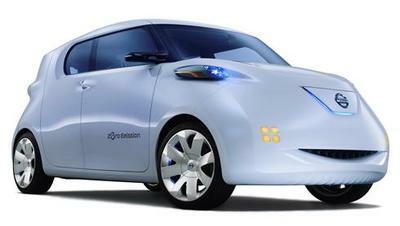 The Nissan Townpod – a battery-electric van-like crossover – was introduced at the Paris Motor Show as a concept. The automaker says the Townpod uses the same powertrain as the about-to-be launched Nissan Leaf hatchback EV and combines elements of passenger car and light commercial van. It has four doors for passengers and four for stuff – a pair of side-opening “barndoors” in the back and a small double-door hatch in the top tall things to poke up through. The cargo floor is fllat and tthe rear seats folds up and hides away to increase cargo room.